Production, processing and transport of feed accounts for 45 percent of the livestock sector’s GHG emissions.3 The rise of industrial production has resulted in nearly 30 percent of all cereals used as feed for livestock production. By 2050, nearly half of all cereals grown are expected to feed pigs and poultry—unless we dramatically transform the economic and political drivers that lead to mass production and over consumption. 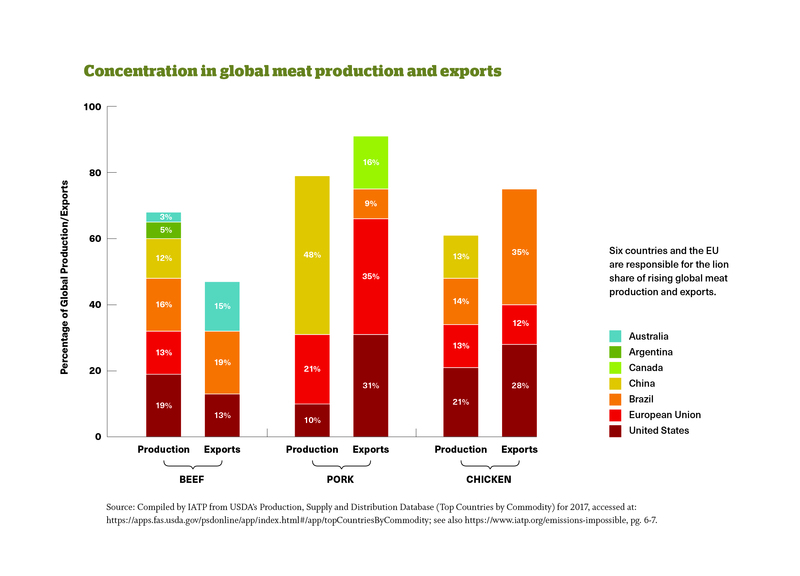 A handful of governments (Figure 1) and global agribusiness giants (Figure 2) are responsible for propagating this extractive model of livestock production. The U.S., Canada, the EU, Brazil, Argentina, Australia and New Zealand all have both surplus production and high per capita consumption of meat and dairy. These entities plus China produce nearly 60 percent of emissions from beef, poultry, pig and dairy production. 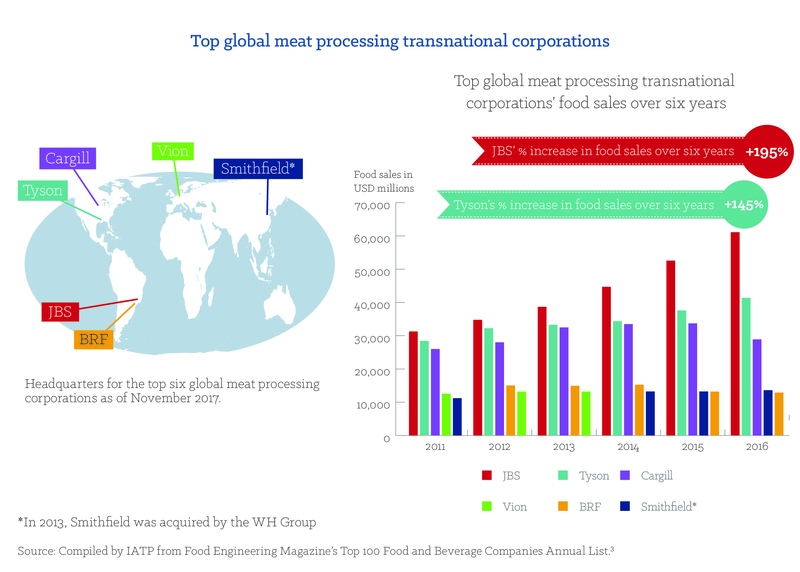 Using FAO’s Global Livestock Environmental Assessment Model (GLEAM), GRAIN and IATP calculated the GHG emissions of the world’s 35 largest meat and dairy corporations. 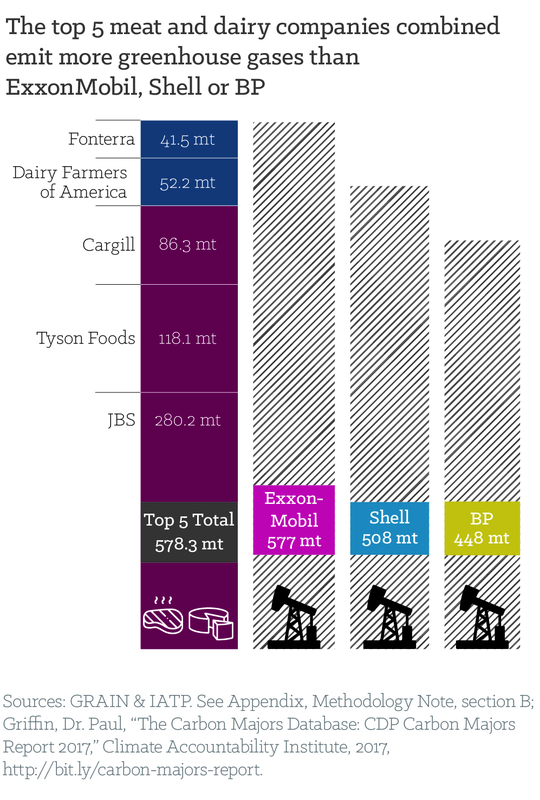 The top five combined emitted more in 2016 than ExxonMobil, Shell or BP (Figures 3). Of the few companies that report on their emissions and set reduction targets, most are either underreporting or do not have credible targets. A focus on emissions intensity reductions will not keep us under 1.5°C in the next 20-30 years. Emissions intensity refers to emissions generated per kilogram of meat or milk. Emissions intensity targets focus on GHG reductions per kilo, but are greatly outweighed by rising total emissions resulting from the overall increase in the number of animals produced. While intensity may be kept in check or even reduced, total emissions are rising in tandem with the increasing scale of production. Integrated crop-livestock systems also have potential to substantially increase productivity compared to grazing alone. In problem soils in Australia, these integrated systems have shown the potential to increase production 25-75 percent.6 However, there have been few or no comprehensive life cycle assessments aimed at quantifying overall GHG emissions from integrated systems. Based on measured parameters, there is a reasonable possibility that such systems will have climate benefits compared to non-integrated systems. The available research shows promise, and more research should be devoted to understanding the strengths and limitations of these systems, which can vary considerably. 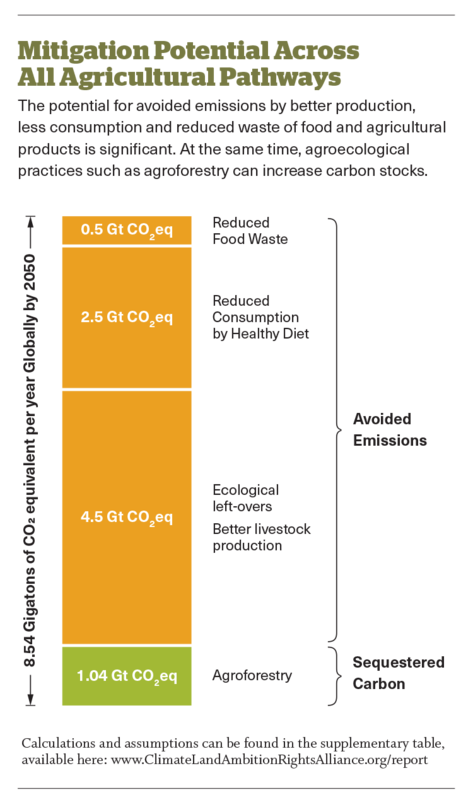 A transformative approach to limiting GHG emissions and the land area devoted to livestock production, dubbed ‘ecological leftovers for livestock’, has been explored in several recent research efforts. With an ecological leftovers approach, livestock feed largely comes from parts of the food stream not consumed directly by people, such as food scraps, crop stubble or food waste and grazing on land that is mostly unsuitable for arable crop production—hence the term ecological leftovers. This approach is based on greatly limiting the use of food crops to feed livestock, in contrast to merely decreasing emissions intensity through technological innovation and more efficient production methods. The Climate Land Ambition and Rights Alliance’s (CLARA) Missing Pathways to 1.5°C report provides a pathway to achieving 1.5°C for agriculture that includes livestock, while upholding the principles of equity and rights and respecting planetary boundaries (Figure 4). It is time that governments revise their Intended Nationally Determined Contributions (INDCs) to include targets and strategies to significantly reduce GHGs associated with industrial meat and dairy. These revisions must include clear strategies to work with farmers and ranchers for a just transition towards adoption of agroecological principles and practices. CLARA 2018. Missing Pathways to 1.5°C: The Role of the Land Sector in Ambitious Climate Action. Climate Land Ambition and Rights Alliance (CLARA). GRAIN and IATP 2018. Emissions Impossible: How Big Meat and Dairy are heating up the planet. IATP 2017. The Rise of Big Meat: Brazil’s Extractive Industry. Gerber, P.J. et al. (2013).Tackling climate change through livestock – A global assessment of emissions and mitigation opportunities. FAO.